Stiggy’s Film of the Day The Uncanny (1977). – Stigmatophilia's gore splattered corner of insanity. Home › Reviews › 70's horror › Stiggy’s Film of the Day The Uncanny (1977). Stiggy’s Film of the Day The Uncanny (1977). From a personal point of view there is nothing better than a good old horror anthology, given my attention span is not always up to par. I find these segment based movies are always great if you don’t want to get stuck into something you have to engage with for a long running time. 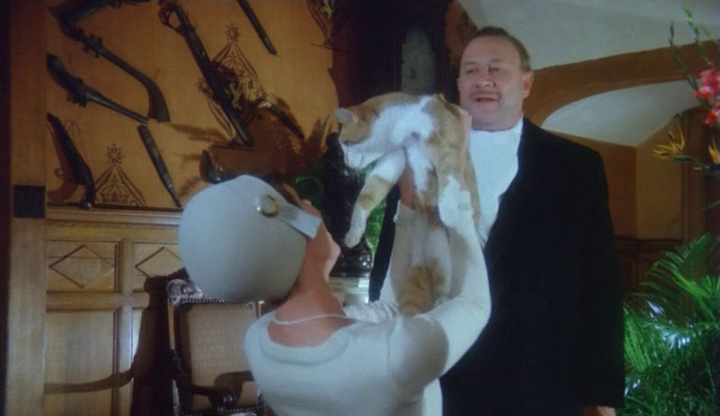 Which brings me to todays choice The Uncanny- an anthology of cat based horror stories starring none other than the marvellous Peter Cushing, and also the equally wonderful Donald Pleasence. Seeing the name Milton Subotsky attached on the production end one would assume this was something to do with Amicus, and it definitely bears a resemblance, but it is in fact a largely Canadian effort and comes directed by Denis Heroux (Valerie 1968). The film takes a three-pronged attack held together by this particularly ridiculous leading story which features Cushing as a writer, Wilbur Gray. Our supporting lead has found out a dark secret which threatens the entire foundations of humanity as we know it. Furthermore he has proof in his research surrounding some mysterious deaths. Yes Ladies and Gentleman cats are in fact in charge of THE WORLD- beware, for just knowing this could put your life in danger. In fact they have always been in charge it’s just we don’t know it yet. Peter Cushing as always is the consummate pro, even if this is one of his weaker films in terms of script; as per usual he gives it his absolute best and in doing so helps raise the level of the overall piece. Cushing picks up the focus as Grey, pitching his new book to Editor Frank Richards (Ray Milland), the plot uses this as a central line to slot in three stories- supposedly told by Cushing’s character in reenactments in which unexplaned deaths could actually have been murders commited by cats . Even though the whole thing is a bit on the silly side Cushing’s performance somehow manages to keep things together as he unravels his tales of dread and imminent danger to his Editor. The first story is set in 1912, London and involves a wealthy old bat Miss Malkin (Joan Greenwood) who nearing the end of her life, wants to leave her considerable estate to her hundreds of cats . 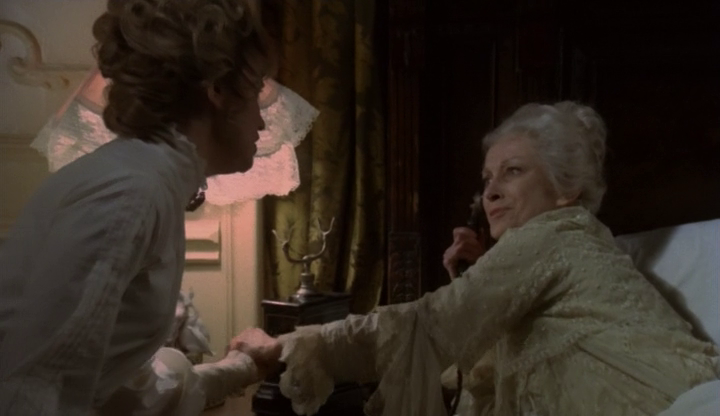 Her nephew Michael (Simon Williams, Upstairs, Downstairs) is a lazy scrounger and she thinks he has taken enough already. Of course she doesn’t know he is secretly dating her maid Janet (Susan Penhaligon) who gets wind of all this and the two decide to take drastic action. What unfolds concerns the cats protecting what is theirs. Even it’s all fabulously far-fetched, and some of the things that happen you are just sat shaking your head thinking why?! It is by far the goriest, and has a considerable amount of fun factor. I will not spoil all the little details, but there are some great attack scenes; even if they tend to veer on the ludicrous side. As far as tension or shock goes, it does have its moments and it certainly hits the spot on the entertainment stakes . Overall a strong opening act. 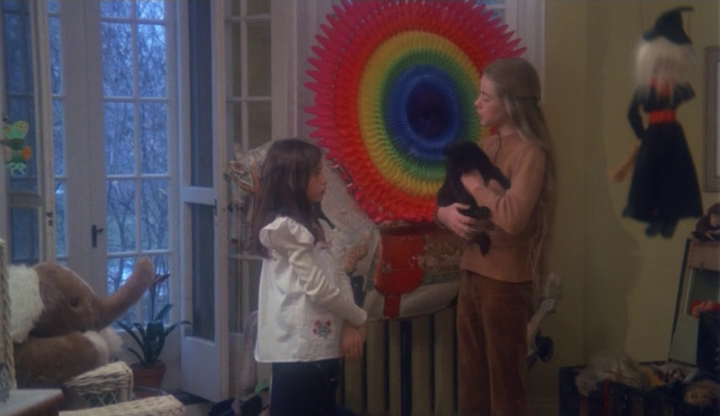 After a bit more with Cushing, who is getting more and more nervous at this point because the Editor’s cat is eying him up, it is straight into the next story which focuses on the then present day 1975, Quebec Province; about a young girl Lucy ( Katrina Holden Bronson, adopted daughter of Charles Bronson) who following the death of her parents is forced to live with her miserable Aunt Mrs. Blake (played by Canadian actress Alexandra Stewart), her husband and vile spoilt brat cousin Angela (Chloe Franks, Whoever Slew Auntie Roo?). Lucy’s only consolation is her feline sidekick Wellington who does not manage to carry favour with the rest of the household. This tale is arguably the weakest, it does involve elements of Witchcraft, but under the sloppy scripting is obvious and predictable, not to mention ever so slightly dreary. The piece is not let down by any of the performances involved either; Lucy, the bratty Angela , and strict Aunt Mrs. Blake were all believable enough, but sadly they just did not have a lot to work with. 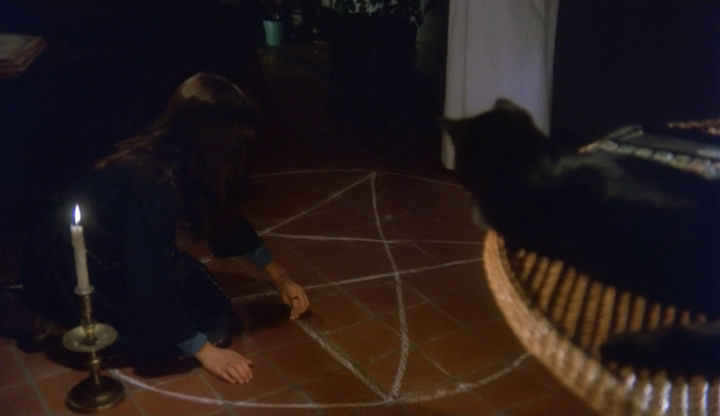 Because of this the film tends to lose its momentum during the middle point and it may come as a relief after this part to get back to Cushing and his bizarre rantings about cats taking over the world. The third part, set in Hollywood 1936, was an obvious case of leaving the best until last, as it is clearly miles ahead of the other two segments. 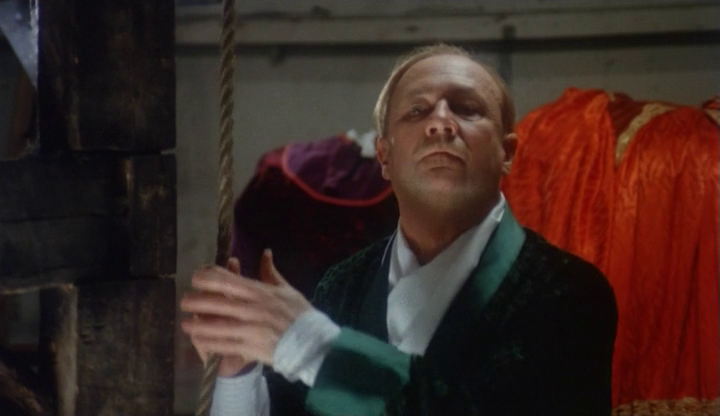 It features Donald Pleasence as a suave, egotistical, dastardly film star Valentine De’ath who manages to bump off his actress wife on a film set by swapping over the fake pendulum ( Pit and the Pendulum style). Following this he then brings in his mistress and tries to stuff her into her ex-wife’s shoes, literally, by getting the director to cast her in his recently deceased wife’s role; just one problem the little air head cannot act for toffee. What is great about the tone of this part is the underpinning gallows humour seems to allow free rein to just camp it up; as such it becomes darkly comic, and genuinely so. Donald Pleasence does not disappoint, portraying a melodramatic, fat headed actor, who will stop at nothing to get his own way. Pleasence really manages to inject an air of pantomime villain into his role, with his constantly hamming it up giving out a vibe of cheesy fun in its own way. 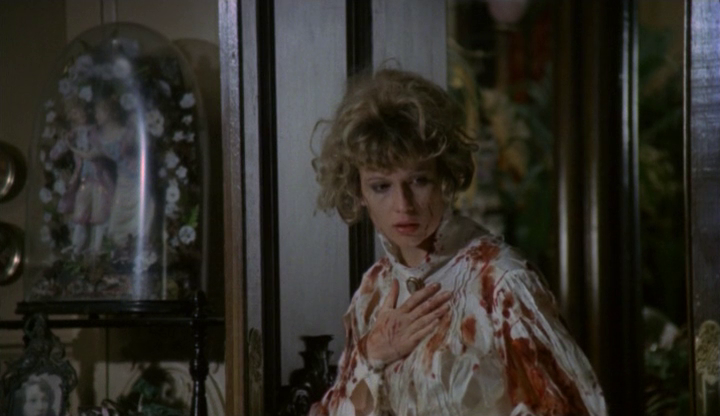 The use of a horror film within a horror film is also a marvellous starting point for a narrative (although this was also done in another of Subotsky’s productions Amicus anthology The House that Dripped Blood (1971) ). So a massive thumbs up for this part, allowing an overall lukewarm affair to end on a high note. 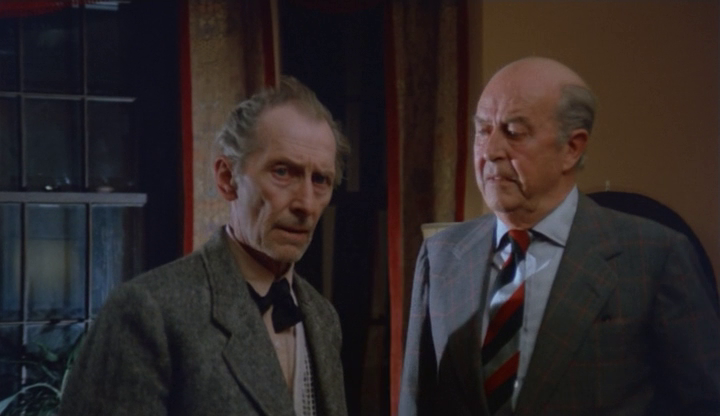 Despite the Subotsky connection The Uncanny really isn’t a patch on some of the Amicus anthology features from the same period. It lacks pacing, although the first segment was entertaining enough and the third pushes up the bar a couple of notches. However, the hit and miss approach sadly makes it on the whole mediocre; only saved by Cushing, Pleasence and some nice gore at the beginning; the middle slump lets it down completely, wrecking the momentum that had started to build in the opening act. Peter Cushing’s parts were exquisitely played out, albeit silly, but for that it gives you an opportunity to revel in just what an old pro he was, never faltering, always playing his part with total conviction. Alongside this the solid casting and decent performances from the wider cast- and the fact that it was reasonably well made- save it from being a complete disaster. Sadly though on the whole not a brilliant effort, and while The Uncanny does offer some fun and entertaining moments, it lacks the spark to make it great.